A pageant very much unlike the ones on television, the Miss Eeyou Eenou Nation was put on by the Cree women of Eeyou Istchee Association (CWEIA) on March 2nd in Chisasibi, crowning Waskaganish’s Andrea Mcleod as the new Queen, Theresa Gunner of Mistissini as the first runner up, Erin Gull of Ouje-Bougoumou as the second and Mina Tapiatic of Chisasibi as the fourth participant. “It feels really good but I am still feeling a bit overwhelmed. I definitely was not expecting this at all actually. It was such a great experience to be with the girls on stage and to participate and represent my community,” said Mcleod. According to the CWEIA, the purpose of the pageant is to empower young Cree women through cultural pride and knowledge with a grand prize of entry into the Miss Indian World (MIW) pageant at the Gathering of Nations in Albuquerque, New Mexico. Nineteen year old Mcleod is currently a part time student, just finishing up her high school credits so that she can move on to higher learning with the intention of becoming a social worker just like her father, Darrin Mcleod. As Mcleod explained, preparing a pageant participant is a community effort. In order to be eligible, the participant has to be between 18-24 as of April 27,2019 to be able to participate in Miss Indian World but also has to be selected and prepared by the community. Mcleod said that she was encouraged by the youth council several times over to be Waskaganish’s entry as there is only one participant per community and several times she tried to back out. It was finally the convincing of local Youth Chief, Conrad Blueboy that moved Mcleod to get up and represent her community. “I thought I was the wrong person to send to this but he kept telling me, that I could do it because he felt that I could really inspire people. I thought it was really great that he saw this in me when I didn’t,” said Mcleod. Participants are judged on cultural and traditional knowledge, public speaking, this year’s speech topic was domestic violence and also on the traditional dress that they wear which is something that the community prepares for them. As Mcleod explained, her community’s cultural department held sewing nights on Tuesday’s and Thursdays and it was the women that attended those that beaded each individual flower onto her dress made of hide. 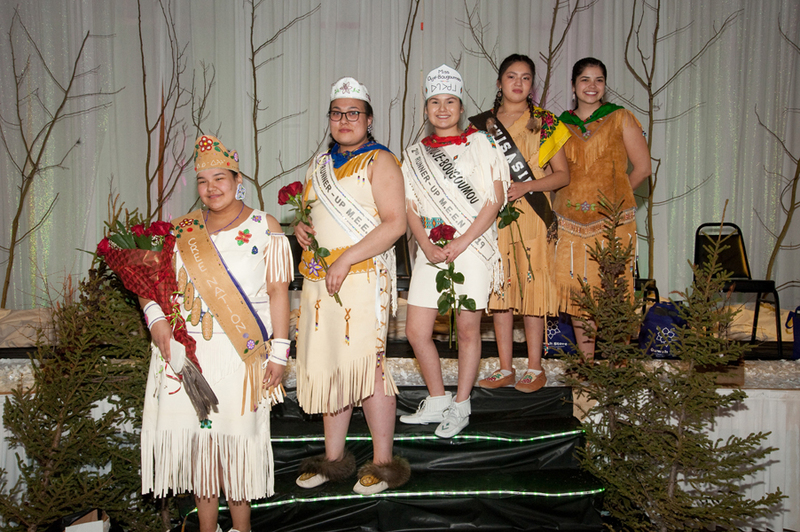 Participants are also asked how they interpret beauty through their culture which is key because the whole premise of the pageant is to empower young women in Eeyou Istchee as a means of strengthening the whole Cree Nation. The 2017 winner, Kayleigh Spencer was on hand to be a part of the pageant and fulfill her final duties of being pageant queen for the last two years as the event only happens every second year. According to Spencer, Mcleod has got a really exciting and very rewarding two years ahead of her, describing her term as “rich in teachings.” Mcleod will not only be a role model and spokesperson but someone who will be representing and presenting Eeyou Istchee to the Indigenous world in Albuquerque come April. “Although it was tough to be on foreign land and competing with other amazing aboriginal women, I couldn’t have done it without the support of the Cree Nation,” she said. “Throughout the two years, I’ve been able to learn from and speak to neech uuschinijuuch by visiting schools and attending events such as: indspire hope, CNYC conferences and a mental health symposium with Manuuhikuu. It has been a very rewarding experience; it has increased my self-confidence and my pride as a Cree Woman,” said Spencer. 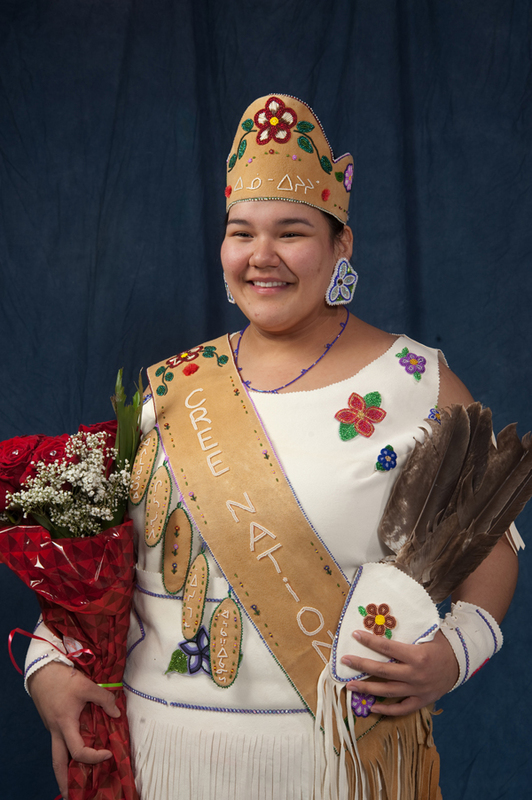 Going from being the girl who thought she didn’t have it in her to being the pageant queen, Mcleod has two incredible years ahead of her and she will get to be the voice of the Cree Nation as much as she will hear the voices of the Cree Nation. On behalf of the Nation Magazine, congratulations to you, Andrea Mcleod!